Thailand and Cambodia are in a constant battle although most people might not know this. You don’t really hear it in the news in either of the two countries and you definitely don’t hear about the soldiers dying. The conflict is over the ancient temple of Prasat Preah Vihear, which is located directly on the Cambodia-Thailand border. Ever since the temple gained Unesco Status in July 2008 Thailand has been trying to claim the temple, which has a main entrance on the Thai side, as their own. Recently, as in the last couple of days before I explored the temple, there have been a few skirmishes where soldiers have died and Thailand has closed their entrance to the temple for the time being. When I decided to head up to the temple, I was unaware of the recent casualties and didn’t really question the reasons why the Thai side was closed. I had also heard that the road up to the temple was a dangerous dirt road full of treacherous potholes that feed on small cars, but being the “new me” who is constantly seeking adventure, I decided to do it. 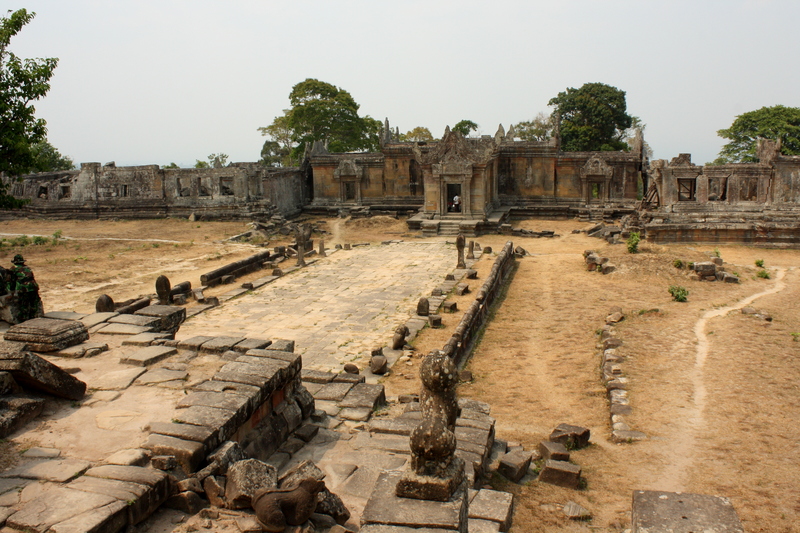 After our third and last day touring the temples, my friend Nauman and I decided to find the little dot on the Lonely Planet map that said “Prasat Preah Vihear Share Taxi Stop.” After a slow creep down the street, scrutinizing every shop front, we found it. And finding it was an understatement. When our tuk tuk rolled up to the place, we were suddenly surrounded by at least 10 men, yelling destinations and times and prices. Our tuk tuk driver acted as a liason and after much haggling, we were scheduled to be picked up the next day at 7 AM, with no guarantee of how many people would be smashed inside the small car. Well, lucky for us, there weren’t too many people in the car. One guy in the back with us and two guys in the front seat. Glad I wasn’t in the front seat (we eventually picked up another passenger who crammed in the back with us) and for the next four hours or so I can’t complain that I was too uncomfortable. The dirt road that was continuously under construction didn’t help much and I can see how the road would be impassable during the wet season because it was practically impassable on our journey. We made it to the bottom of the mountain, met up with two motorbike drivers, had a quick and oddly expensive lunch and soon embarked on our adventure up the mountain. And once again, up was an understatement. I resisted the urge to cling to my driver who somehow needed to jerkily change gears on the steepest inclines. And these inclines were steep! I felt like we were going straight up at times and I wish I had a videotape of my ride because a humungous smile was plastered on my face from start to finish. I was so incredibly excited and happy to be where I was. I had heard so much about this temple and I was finally going to see it! We passed an army encampment (the place where Lonely Planet says is a hotel, a little strange if you ask me) and were soon surrounded by men in green posted to protect the temple. Walking up the path to the entrance, we passed bunker after bunker filled with ammo and a large gun (I’m not well versed on gun types or else I would state what kind of gun it was, but for the purpose of this post, the guns were quite big). 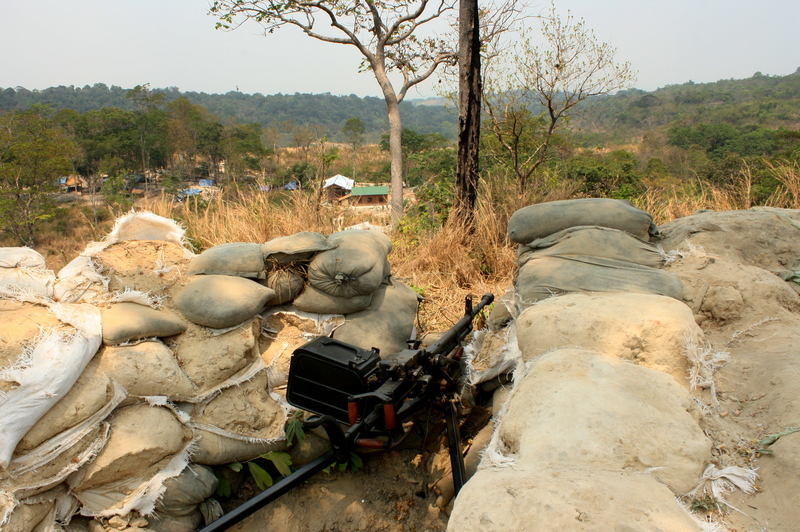 Sometimes men were sitting in the bunkers, ready for action, and sometimes they were meandering around the temple grounds (At the time, I was unaware of the actual closeness of the battle and that I was only mere days after actual warfare and death). Then we made it to the temple. And it was definitely worth it. The temple is made up of four tiers, many steps followed by a temple, then more steps, and another temple, you get the point. It was pretty run down, but that of course is the allure of the ancient temple. Cambodian pride signs are posted everywhere telling visitors that “Preah Vihear our temple” and “Determination to protect Preah Vihear forever.” I was also lucky that my motorbike driver walked with us and attempted, in his very broken English, to tell us what things were. By the time we reached the last temple, we were pretty high up (well, we were already on a mountain) and what an incredible view it was. I felt like I was on the edge of the Earth, and for a second it definitely feels that way because there is no barrier between you and plummeting to the countryside below. This put my fear at the Grand Canyon to shame ( I could barely walk up to the edge with the railing, I had to slowly inch myself forward until I could firmly grab the railing… but that was the “old me”). I couldn’t bring myself to get close to the edge and every time someone took a picture or came close to the edge, I cringed and couldn’t watch. 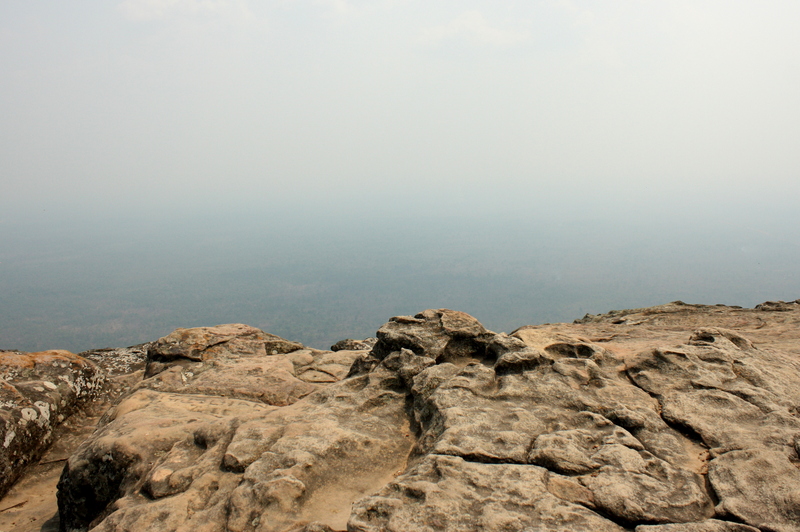 But I could have sat there for hours just taking in the Cambodian countryside in front of me. It was so peaceful and quiet, and because the Thai side was closed, the tourists were luckily at a minimum. Sounds like the best part of this trip was the roller coaster ride getting there and back. I am going to have to guess you are a fan of six flags. Glad you made it in one piece! Yup, that’s pretty much how I remember it too. Nice writing. And also happy to see I got mentioned once. 😉 Greetings from Thailand, by the way. I’m back here indefinitely after exploring 3 or 4 more countries since Cambodia.